Titomic (ASX: TTT), a developer of 3D printing, returned a solid 113% in its first month post-listing, but sky rocketed to 1250% by the end of June 2018. Wattle Health (ASX: WHA), a developer of infant formula and dried milk products finished the 2018 financial year with a return of 360% since it listed in May last year. As OnMarket is an online capital raising platform, it is always interesting to see how quickly our members respond when a new offer is posted on the platform, especially when we only have a limited allocation of stock. So what has been the fastest raise to date? It took only 34 minutes for OnMarket to fill our allocation of stock in The Hydroponics Company (ASX: THC), a manufacturer and distributor of cannabis products. In January 2018, OnMarket was granted an equity crowdfunding licence by ASIC, enabling us to offer to our members the opportunity to invest in early stage, innovative companies looking for growth capital. In the relatively short time we have offered equity crowdfunding there have been two significant highlights. Revvies Energy Strips, a developer of fast-dissolving caffeine mouthstrips, was the first company in Australia to raise capital under the new equity crowdfunding rules, successfully closing their equity crowdfunding campaign with over $250,000 raised from close to 300 new shareholders. 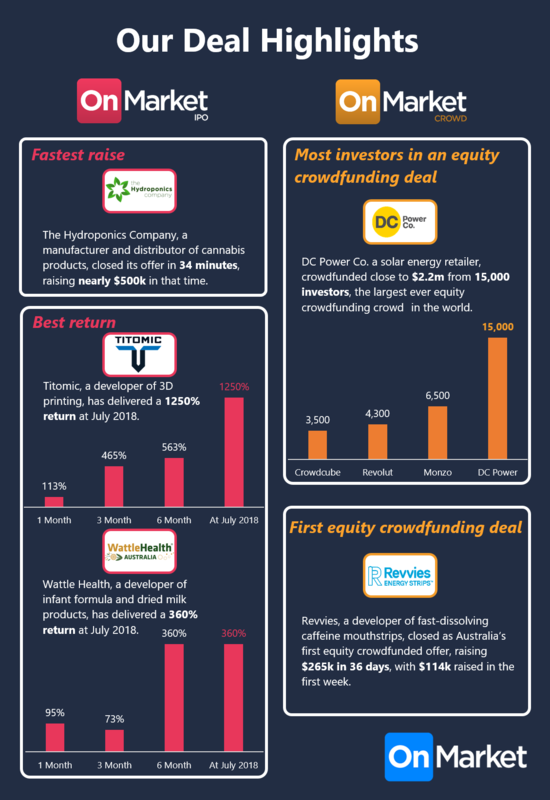 The other highlight has been DC Power, Australia’s first solar-focused energy retailer, which raised $2.2m from 14,950 investors making it the most investors in an equity crowdfunding deal ever. To put that achievement in some perspective, the next closest campaign, Monzo (formerly Mondo) raised £2.5 million from 6,500 investors in its 2017 raise on the Crowdcube platform in the UK. Even if you did miss out, we’re committed to bringing you more investment opportunities like these in the future.